A few miles north of Dunmanway in west Cork is the rural hamlet of Coolmountain. In summer, this is a particularly lush and green place, wooded and mountainous, isolated and peaceful. The land is rough but resourceful. The landscape of Coolmountain seems to have retained an authentic rural feel: the roads are poor, the houses sparse and there is a sense of timelessness about the place. The ruins of Coolmountain National School comprise a detached gable-fronted three-bay single-storey school, built c.1945. It has a pitched asphalt roof with cast-iron ‘rainwater goods’ (i.e. gutters and drainpipes). The windows comprise square-headed openings with metal casement mullions and timber sills. It also has a square-headed door opening with a timber battened door, overlight and concrete steps. Rendered walls to the front and sides of the plot enclose a small schoolyard which can be accessed through a wrought-iron gate. The building ceased being used as a school in 1969 but was lived in until 2005. It is near collapse and unlikely to survive much longer. This structure was strategically positioned for use by the local rural population and its educational and social importance is highlighted both by its commanding views of the surrounding landscape and by the large plot of land on which it is sited. The use of corrugated-iron as wall cladding adds texture and interest to a building of modest dimensions and materials. 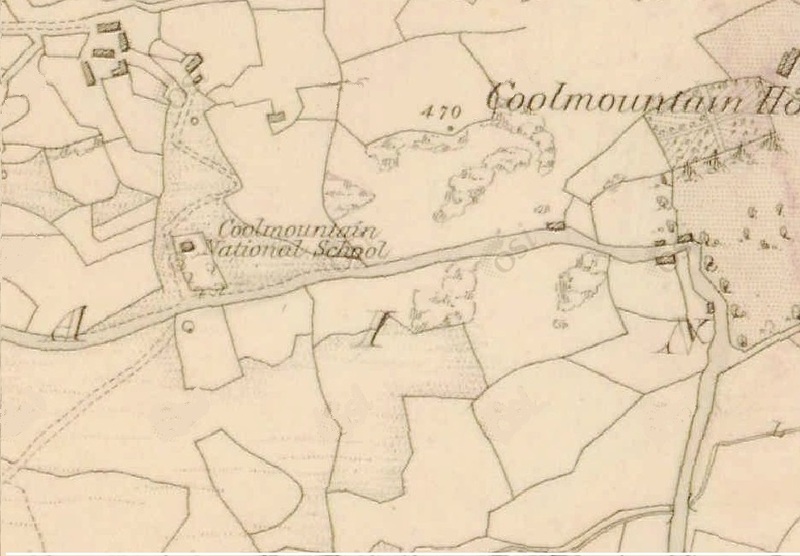 According to Jerome Kelly, from the nearby townland of Clogher, the original school at Coolmountain was built in 1835 for the sum of £50. It burnt down in the early 1940s. Following the fire, pupils were temporarily schooled in a cottage in Clogher while the school was being reconstructed. The cottage was owned by a Mr Murphy. Jerome’s older brother, Michael, started school in 1943 in that cottage. Jerome Kelly himself started school in the ‘new’ school building on 23 August 1949. He remembers that a plaque over the door of the new building had a date of 1945 on it, probably the year that the rebuilt school opened. The new build comprised a one-room structure with a porch. There were two dry toilets. The building was heated by means of a small cast-iron stove – students themselves brought in the fuel. I came across your blog today for the first time. What beautiful photos of a building i have walked past a lot! Growing up just down the road and having prettt much free reign of our surroundings we were however not allowed to go into the school. Article says it was lived in until 2005 but it wasnt as far as i remember ever lived in, my memory probably goes back to mid 90’s. The entire front garden was covered in all different coloured primroses until the fir tree in the corner fell few years back in that storm. It always had an eery feeling about it and i never went further than clambering along the wall! Anyway keep up the good work…its beautiful. Have you paid a visit to old secondary in dunmanway…. My Grandfather attended this school and his home was situated at the very top of the driveway adjacent to the school. I am told that the original structure was destroyed by a fire some years ago. Apparently the father of the renowned Dublin goalkeeper John O’Leary taught there for a spell in the 1930’s. I also would have visited Coolmountain on and off as a child in the 90’s and never remember the school being lived in. Brilliant article… I grew up in coolmountain from the early 80’s to the mid 90’s and do remember the school house being lived in by a brother and sister who’s parents passed away when they were quite young and they were reared by there uncle and Aunt and moved back to the school house when they were older. I am not sure if either of them lived there as late as 2005 though. I agree with Emerald there was always an eery feeling about the place.